Available online from Hannants for £38.75, Redroo Models for Au$67.00, Westcoast Hobbys for Cn$55.00 and various other CMR stockists. Not really a disadvantage, but some parts are approaching the limit in terms of smallness and scale finesse - great care will be needed with these. Almost certainly the definitive DH9A in any scale. Suited to modellers with some resin and multi-media experience. A superb kit. The original DH9 was a development of the very successful DH4 bomber. However lower than expected power from its BHP engine led to poor performance. The DH9A was a significant improvement over the DH 9, with almost double the power from its American Liberty engine. It also had larger span wings and a strengthened fuselage, plus a return to an engine cowl and radiator reminiscent of the DH4. The DH9A saw service late in WW1 and went on to have a successful career with the RAF until 1931, as well as several other air arms. These included the Soviet Union’s where it was produced by Polikarpov as the R-1 and various derivatives. The DH9A lived on in a sense in the Westland Wapiti, which won a design specification for new general purpose aircraft using as many DH9A parts as possible; the most obvious being the Wapiti’s wings. 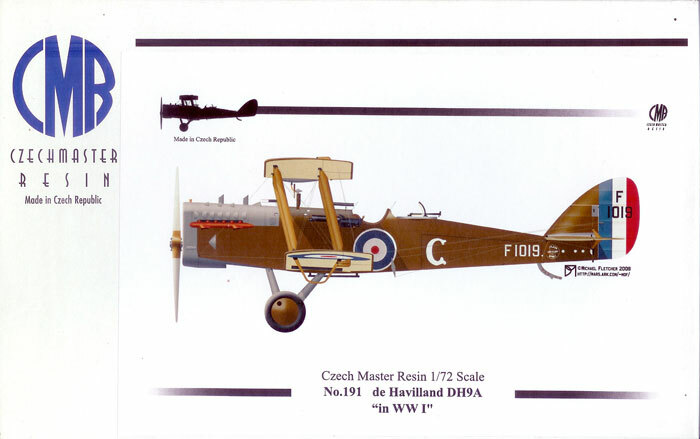 CMR's 1/72 scale DH 9 is packaged in typical Czech end-opening box with attractive box art. The parts and decals are in heat sealed plastic bags, which in turn are sealed in a further bag with the instructions and photo-walkaround. Straightforward instructions consist of three double-sided A4 pages. The parts map and constructional illustrations are very clear and easy to follow. 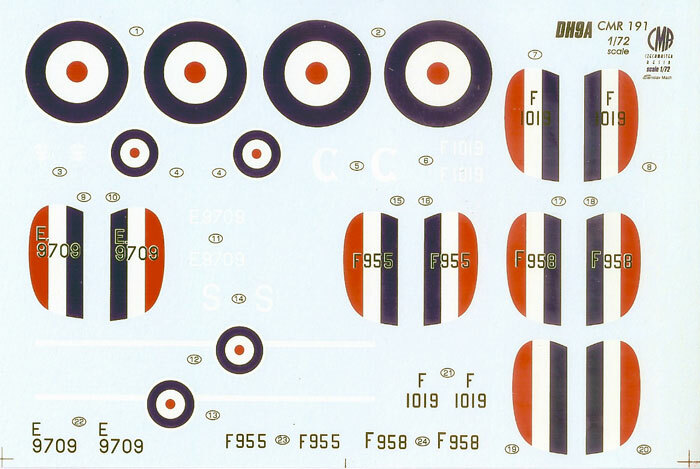 A double-sided page gives comprehensive colour plans covering options for four aircraft in service during 1918. Detailed colour notes and other written instructions are in English. Two more double-sided pages provide an excellent photo walkaround focused on various detail aspects of the aircraft. The parts breakdown is completely conventional for a biplane of this type. 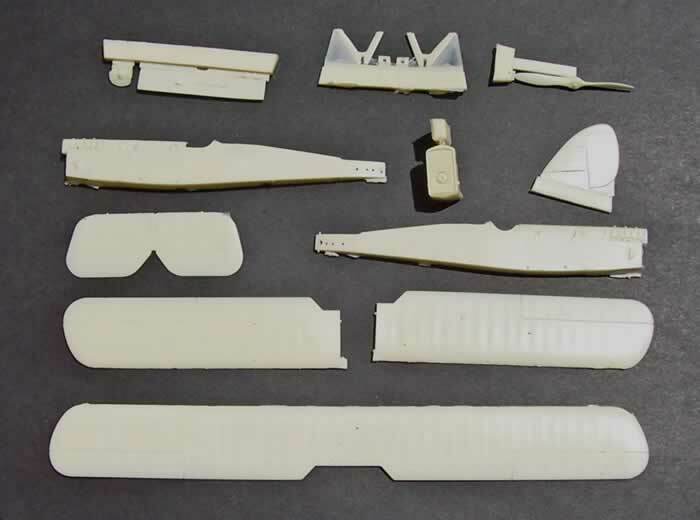 In fact it is only presence of small casting blocks or little bits of flash that make the major airframe parts any different from a conventional injected styrene kit; and it will take only a matter of minutes to remove and clean these up. Surface detail is very realistic and finely done. Smaller parts are of course on casting blocks, but in most instances will only need to be removed by a craft knife. The main wing and cabane struts are in a darker colour resin that no doubt has properties better suited to their weight bearing role than the cream resin used for the remainder of the kit. 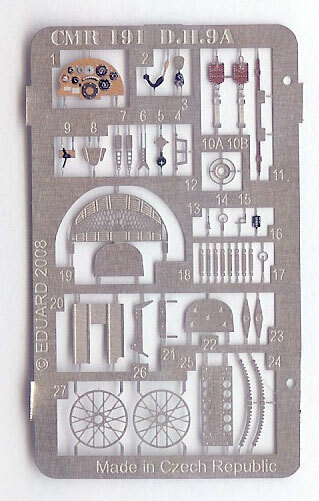 The thing that stands out about this kit is the large number of incredibly fine small detail parts provided. I suspect they represent close to the limit of the casting art. The modeller will also be kept busy attaching numerous control-line horns. I prefer these separate horns to ones moulded with flying surfaces as they are better shaped and can be fitted later in the build (the fixed ones being prone to damage during construction). Other very fine details are provided for by the Eduard-sourced Photo-Etch (PE) fret. 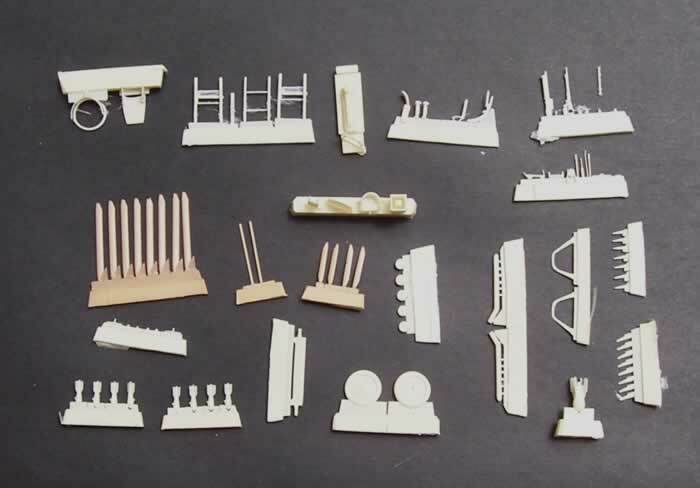 This provides numerous small details like Vickers Gun cocking lever, gun-sights, bomb racks, wicker pilot’s seat, and pre-coloured instrument panel and seat harnesses. Spoked wheel rims on the PE fret are identified as not required, suggesting a post-war boxing will follow. For those who do not like PE there is the option of a resin pilot’s seat and instrument panel. A photographic negative provides for windscreens, with their shape indicated by black outlines. 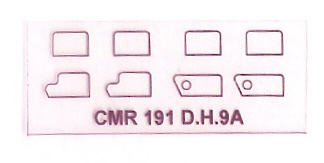 Decals are typical of CMR, being well registered and suggest good opacity. Based on past experience they should be very good to use; but like most Czech decals they will be quite thin and need to be floated into position, as they tend to adhere extremely well once there is no fluid under them. Without wishing to belabour the point, the stand-out feature of this kit is in the tiny details. These will serve to capture that WW1 look where all manner of attachments and fittings add interest to the subject. Tiny bombs, their bomb-racks, gun-mounts, tiny gun-sights and ammo drums all combine with very high levels of interior detail to capture that cluttered and “tied-together” look of the real aircraft. This is a superbly executed kit of an interesting subject. 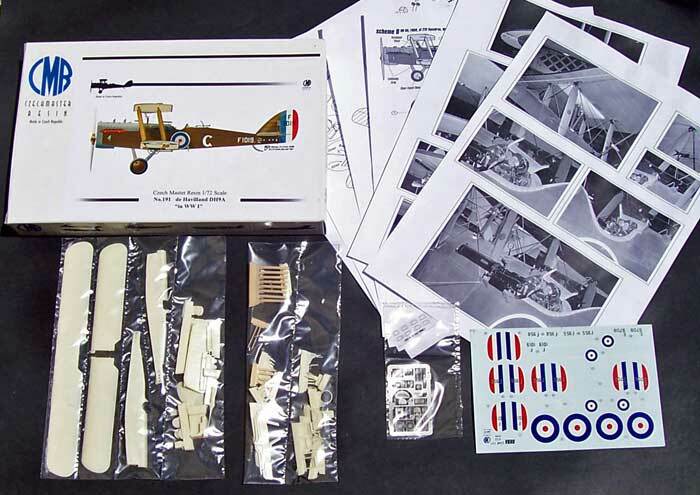 Despite its tiny details and high parts count the greatest challenges are likely to remain those that apply to most WW1 biplanes - fitting the upper wing and rigging. All the other challenges should be met by the application of some extra care and patience.